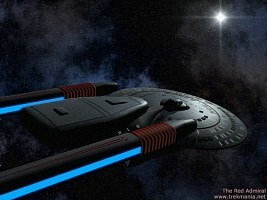 The USS Chekov is the only known member of the Springfield class. Ed Miarecki built the model for the graveyard in "The Best of Both Worlds". 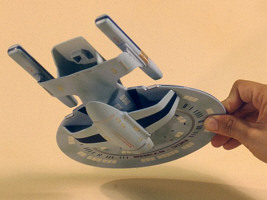 The ship remained a complete mystery until Mike Okuda revealed at least the very basic appearance. We were keeping in mind that it should be somewhere on the viewscreen, since it was in the original line by Shelby when she looked at the screen (which probably read "the Chek(h)ov...the Kyushu...the Melbourne"). 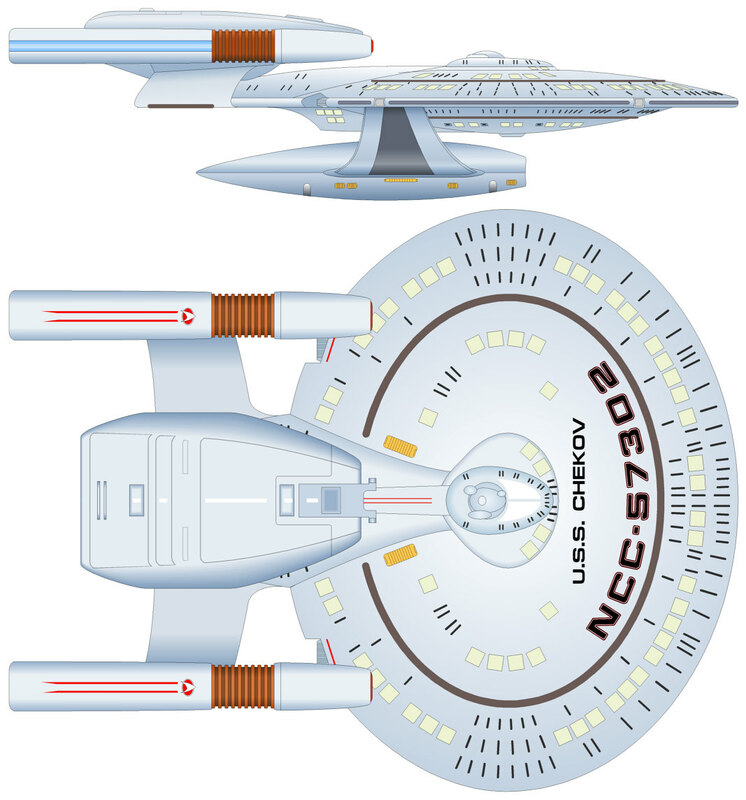 Our information so far, as verbally given by Okuda, was that the Chekov has a Galaxy-style saucer like that of the New Orleans and two marker nacelles. The Wolf 359 Research Project was initiated and is maintained by Mark Delgado, Balapoel, Bernd Schneider, Chris Spinnler, Timo Saloniemi, Masaki Taniko, The Red Admiral and Nick Angeloni. 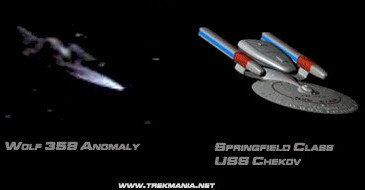 Thanks a lot to Michael Okuda for the above photo of the Springfield and thanks to Timo for conveying it to me. Note to all readers: Please don't further distribute the image and, in particular, don't use it on web pages. It is obvious we have to change the registry of the USS Chekov from NCC-53702 to NCC-57302 - one more permuted number in the Star Trek Encyclopedia. 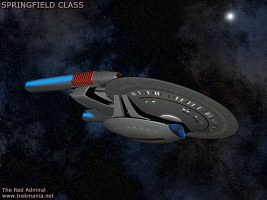 Besides the above Challenger pic, Gary Perry sent us another image of what is obviously the Springfield class. We recently got a better photo by Paul Frenczli, and he confirmed that it's from the famous slide show. 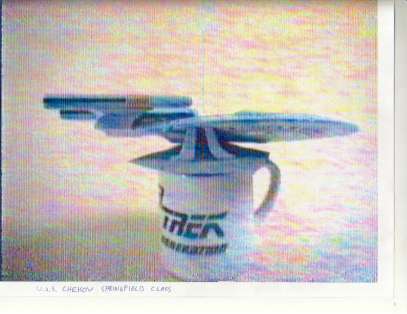 The so far available images clearly show that Miarecki used a 1/2500 Galaxy saucer top. The top view allows the interpretation that, considering the Cheyenne probably consists of two bottom halves, he took the two remaining tops for the Springfield. The side view, however, clearly reveals that it's a top and a bottom piece. 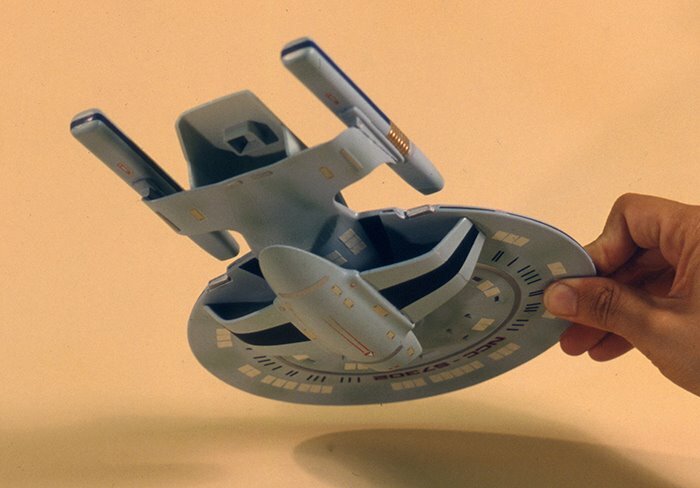 It definitely looks better this way and is more plausible anyway if the ship has a saucer largely identical to that of the New Orleans, with different top and bottom halves. 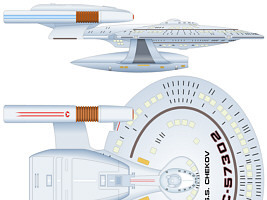 The Springfield's marker nacelles are of the same type as on the Cheyenne. 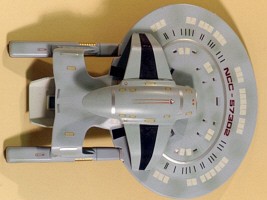 The top view shows sort of a hull "ramp" whose front end is flush with the saucer. The different colors of the angular hull section and the small secondary hull indicate that this is a coffin-like pod, which is attached to the nacelle pylons at its rear end and hovering above the hull in its front half. At the first glance, the side view doesn't seem to have this pod, but what looks like the port nacelle may be actually the pod, as the analysis in the image below shows. 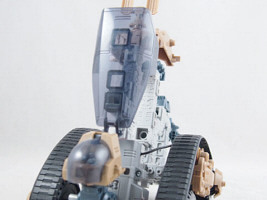 The pod is an originally clear canopy taken from the Treadmaster, a toy from the 1980s that allowed to build various variations of robots and construction machines. Between the saucer and the coffee mug we can make out a secondary hull, which is affixed to the saucer bottom with wide pylons. It is possible that, just like on the Oberth Class, there is no access to that secondary hull other than through the pylons. 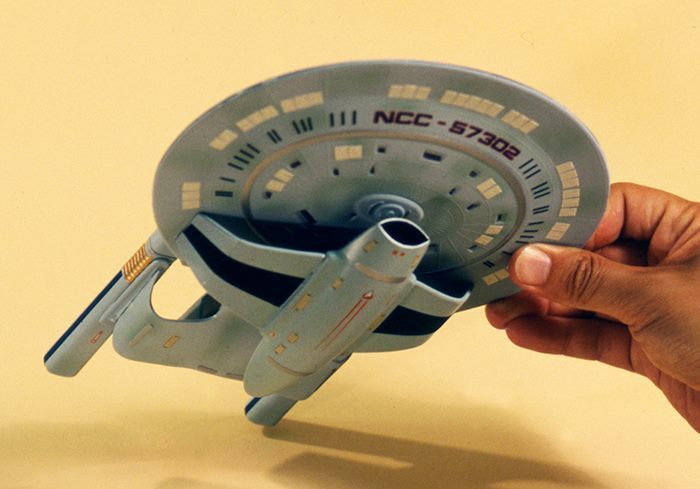 We previously thought that the streamlined secondary hull consisted of an engineering hull of a Galaxy class, made from a 1/2500 scale USS Enterprise-D kit. 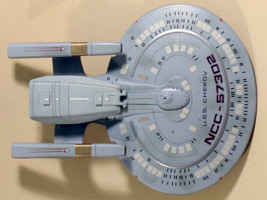 In 2015 and 2016, Rick Sternbach managed to dig up several more photos of the various ships built by Ed Miarecki and used for the Wolf 359 shoots, all taken before the models were damaged (the Chekov was never damaged though). We can see that the lower hull of the Chekov is not made from any Galaxy-class parts but rather from the hull of an early jet fighter. The pylons run appear to run into the secondary hull exactly where the wings of the aircraft model kit were supposed to be affixed. The pylons themselves don't seem to be the (bent) wings of the aircraft model (they look too thin for that) but rather custom parts. It also becomes clear for the first time that there are not pairs of fore/aft pylons with a gap between them (as I previously assumed) but one very wide solid pylon per side, with a black central part just painted on. Based on these photos it is also very likely that the pod is not connected to the saucer hull other than by the pylons. We are confident that we have identified the Springfield class in the Wolf 359 scenes. 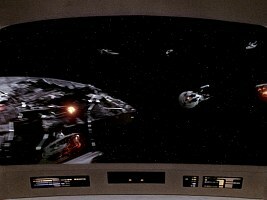 It is a wreck that can be seen in the upper half of the viewscreen on the bridge, and then again in the upper half of the screen when the Enterprise flies through the debris field. Masaki made a sketch of the ship's composition, still without the lower pod. 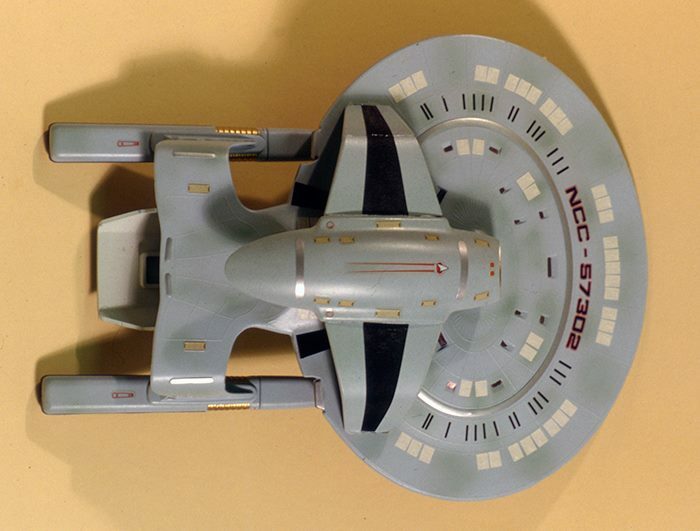 The Chekov was built by Ed Miarecki using the AMT/Ertl 1/2500 Enterprise-D saucer and bridge from the AMT/Ertl 1/1400 Enterprise-D kit. 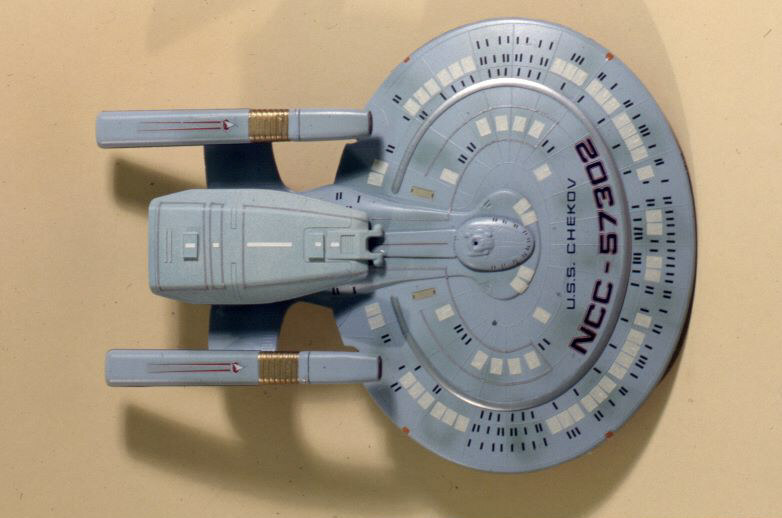 The upper secondary hull may be from the Enterprise-D too, but would have to be heavily modified to fit, so it could be a custom part as well. 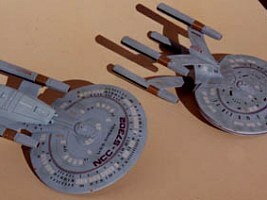 Two marker pens act as the warp nacelles. 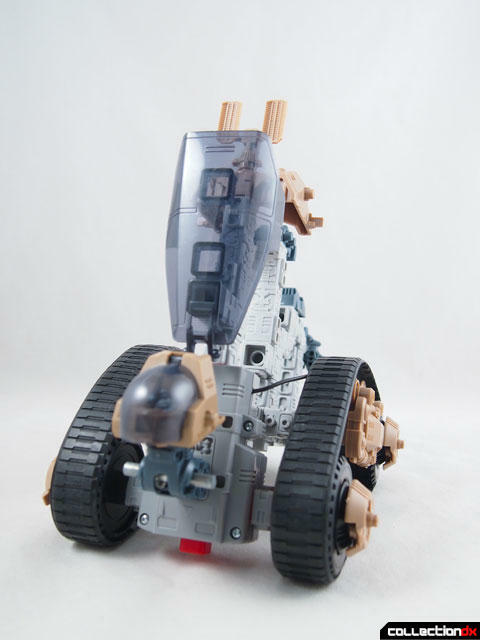 The upper pod could be a custom-made part. There is another suggestion that it could be the part of some Star Wars Rebel fighter, which will require further investigation. We have spotted the USS Chekov on screen, just as postulated. From what Shelby could see on screen, the original line "the Chek(h)ov...the Kyushu...the Melbourne" now makes perfect sense. 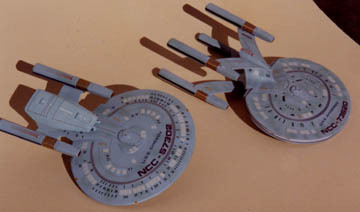 As for the structure of the model, we know that mainly parts of the 1/2500 scale Galaxy-class kit were employed, plus two marker nacelles. The bottom pod of the ship clearly exists but is not made of a Galaxy secondary hull (as it could be left over from the Cheyenne class). 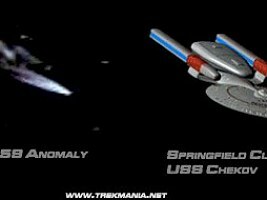 Since the Springfield obviously has a very similar saucer as the New Orleans, and the nacelles are of the same type as on the Cheyenne, we can estimate a length of 325m for the ship. Thanks to Gary Perry, Frank Gerratana, Ryan McReynolds, Paul Frenczli and The359 for images and suggestions. 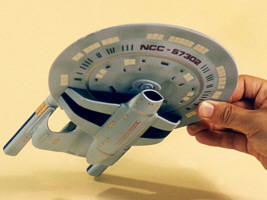 Thanks to Starship Modeler user Valdore who found the origin of the upper pod. Special thanks to Mike Okuda for providing the decisive photo. Big thanks also to Rick Sternbach!